locomente...: The Yummy Butter Story..
And, this is one of the stories of Lord Krishna elaborating how naughty he was! “Lord Krishna was very young; some 3-4 years old. He was loved by all the Gopis. However, he was very naughty. 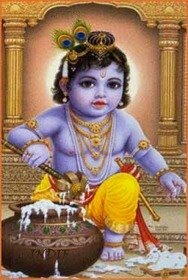 Lord Krishna loved to eat butter. His mother used to feed him herself. But, he always wanted more and more. In order to satisfy his hunger, he started to charm the Gopis, enter into their home by hoodwinking them and have butter. Days passed. Poor Gopis started to wonder where all the butter was disappearing. They were very much worried. They guessed that it was some thief’s work. However, they could not figure out why a thief would be interested in mere butter! But, how long can a thief stay unnoticed? One day, they caught the Maya Kannan red-handed. He was sitting on floor, holding a mud pot filled with butter. The butter was spread all over his body and spilled all around the place. His tiny little face was covered with more butter. Well, I was 2-3 years old myself. I was always fascinated by the stories of Lord Krishna. I was not a very naughty or a tantrum-throwing child. But, this story - which I was hearing for the nth time, which I have heard innumerous times later as well – evoked the devil in me!!! At that time, my mother had gone up to the terrace. I remembered my mother making butter and storing. I grabbed the opportunity! I opened our refrigerator. Then, I eyed at the pot-like-looking steel vessel containing butter. Took a handful of it and started eating. It felt wonderful. I felt like I was eating snow. I still remember how it taste. I was covered with butter from face to foot. Some of the butter was spill on the floor too. Nyways... It was really cute!!! Very nicely linked to mythology.